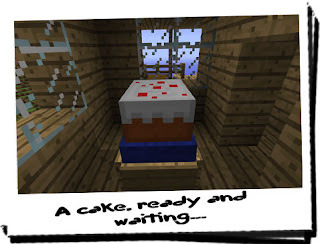 Diary of a Miner: Day 27: I baked a cake... but STILL they did not come! Day 27: I baked a cake... but STILL they did not come! Today started pretty much exactly as it had yesterday: I woke up REALLY early, had breakfast and went straight to the tower to overlook the sea. Nothing! Again! Not even on the horizon! There was no sign of them at all, and I had made it very obvious where I was with the brightly lit pier! I lowered myself down from the tower, feeling considerably let down! They were late! There was no reason for them to be late: HoN Co. boasted some of the best technology in the world, fast ground, air and water transport included! 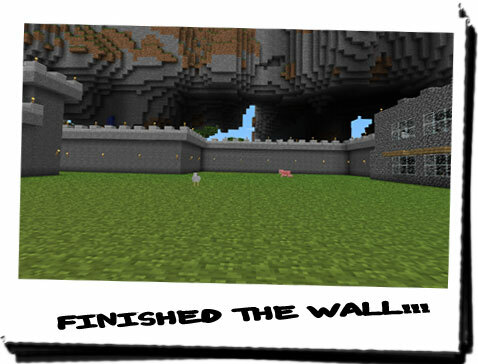 I cast it from my mind and set on with the task that I had been working on for some time; the wall! Today I was determined to finish it! Interruptions or not, this wall would be complete by the end of the day! From early in the morning to late into the afternoon, I worked on the wall, making sure it was secure and there was enough illumination across the top for me to walk across. My main worry though was the proximity the final part of the wall would be to the cliff. Not only was this the place I had seen shadows, but was also the place I had seen a Creeper, not more than a few days before! The last thing I wanted was to be attacked with my back to the cliff! I decided that working by natural light would be better than sticking torches up near the wall whilst I was building it. That way I didn't attract any unwanted attention! I had gotten into the routine of building the wall so much, I was practially stuck on auto-pilot; I had gone past the stage where I had to think about what to do. This allowed my mind to wander, although this wasn't always a good thing. At one point I began to think about the origin of these strange creatures, but this freaked me out too much, and I decided to think about something else! 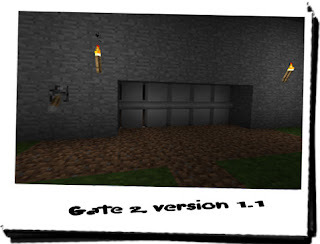 It was then that I had a great idea: build another gate! When the task force arrived, they would be able to utilise it without having to go all the way around from the beach-side entrance! It might even lure some creatures closer, allowing me - or the task force - to investigate them more closely! However, my original gate made use of a flaw in the location; it used sand as part of the barricade. On the other side of the area, there was no sand! I would have to think of another way of creating a gate which didn't have crossed wires or utilise sand! I had it! Within an hour, I had a fully working and fully efficient gate operational! In the middle of working on it, an idea had struck me; extend the length of wires to ensure that the use of sand was not needed! It was so simple, and yet I had not utilised it on the first gate. My intial problem with the first gate was crossed wires. I got round this by alternating the sides with which each piston operated. I made use of the same system, but my excavating a bit more dirt, and laying down a lot more redstone wiring, I was able to make a gate that made use of pistons that worked properly! 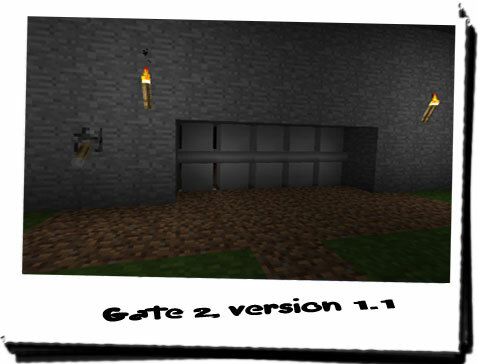 Now this new gate made use of the same piston system from the ceiling, but now the pistons in the floor met them! There was no need for an intermediary material to bridge the gap! With the gate up and running, and only a small amount of the wall to go, I was ecstatic! I hadn't felt so happy with my own work for a long time. 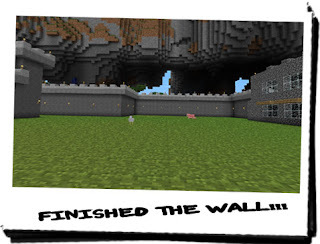 This feeling was added to immensely a few hours later when I finished the wall! It was starting to get very late by this point, but the fact that I had the entire wall finished and illuminated made me ecstatic! I actually whooped for joy! However my joy was quelled rather quickly when I heard a low rasping moan... It almost sounded as though it was answering my exclamation! I climbed the wall - using the same elevator system I had for the beach-side - and looked out into the cliff system, with safety. Nothing! There was nothing I could see; no shadows, no shapes, and yet this was where I had heard the noise! Rather freaked out by this, I decided to retire for the day and returned back to the house! It was still light and I felt like I should busy myself with something to do whilst there was still daylight, so I decided to see if I was able to do anything with the reeds. I had questioned the ability to refine them earlier in the week, and after an hour or so of drying and refining, I found out I could extract a sweet paste from them! I don't think it was quite sugar, but it was close enough, and I decided to cook with it! I had all the ingredients I needed, and decided that a cake would be best, especially if the task force arrived tomorrow. I just need to find a way to grow tea and I'd be set! Oh god how I miss tea! I don't drink much, and when I do, it's mainly water. I might try milking a cow - if they are the right breed for that - and see what I can do with that! 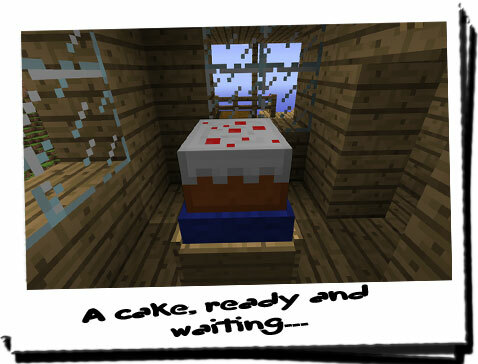 I've just finished the cake, and I've noticed Chiron's not in the house. He was on the porch, staring out across the beach-side wall! I couldn't see anything, but it occurred to me to check. But instead of going all the way down to the wall, why not check from the roof access I had made for the house! After climbing out onto the roof, I looked out over the sea and saw nothing. When I had seen Chiron as he was, my heart began to beat faster. I actually thought the task force was here! But nope, nothing! Not even on the horizon! Perhaps tomorrow.